Ryan Painter was born in 1984 in Vernon, BC. 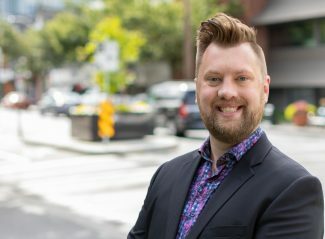 He graduated from the University of British Columbia – Okanagan in 2007 with a Bachelor’s degree in History (specialization in Canadian Political History) and a minor in Geography. After graduating, he decided it was time to see the world, and spent the next four years teaching ESL to children ages 4 to 13 in South Korea and China. Working as a teacher to young children is one of his fondest memories. When he returned home to Canada he settled in Victoria, and is glad he did. Painter worked for three years as a Constituency Assistant for a Vancouver Island MLA, and have since moved on to work at the University of Victoria for the Faculty Association as an Administrative Officer. In his off time, he volunteers as a mental health and anti-stigma activist and community organizer.